Ah, the sunshine! Warm weather is here and it's really starting to feel like spring. We've had a few nights without frost so I will finally plant my herb garden this weekend. I can't wait to have access to fresh herbs whenever I want. Herbs, like the basil I used for this salsa. I know that traditionally, salsa is made with cilantro or parsley but I love the flavour of basil with tomatoes. Try it, you're going to love this salsa too. Enjoy! 1. In a bowl, combine all the ingredients and mix well. 2. Refrigerate for at least 1 hour before serving. Love, love, love salsa! Just made some myself. Yours has that nice raw crunch and warm Mediterranean flavors. Very handsome in that glazed pottery, too. A delicious salsa! I love that stuff! Great picture. Sounds perfect for summer! Great fresh salsa. We just planted several basil plants this week along with tomatoes. Can't wait for summer; it's my favorite time of the year. I've never put basil in my salsa, but it is my favorite herb. I can't wait to try it! Makes me feel caliente all over. What a fantastic shot! It's great to get jazzed for tomatoes. It will be awhile before they are fresh in the Northwest. This sounds yummy! Dragon, this reminds me alot of a classic Bruschetta topping...when the tomatoes are ripe, basil fresh...can't be beat! yum! i loooove making fresh salsa, but the basil is such a wonderful addition! perfect for summer. All the best flavors of summer! That looks delicious! 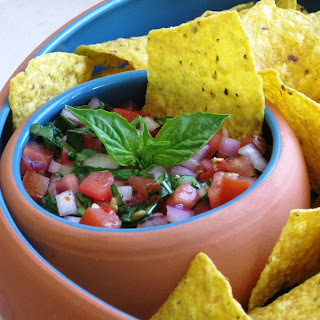 I love the combination of tomatoes and basil and this salsa sounds just wonderful and perfect for summer! Ive never tried basil in salsa before... I bet it is great! This looks so good. I just bought tomatoes and fresh basil at the farmers' market last night. I've never had basil in salsa before, what a neat idea! It's perfect for all the cilanto haters. Yum yum! Great flavour combo! A great dish for the hot weather! Made some just a short while ago Paula, to go with grilld chciken tenders & French Fogausse for dinner. it's YUM...can hardly stop spooning it into me mouth! You said: "I hope you're hungry." My answer is simple: "Yes, I am". I love salsa. It's my favorite snack. It's flavorful, refreshing and healthy. :P oh btw, thanks for visiting my site. I bet the basil tasted wonderful in it! Love that you used basil here. I planted six basil plants in my garden and 8 kinds of tomatoes, so you can bet I'll be making this soon! So easy to make and looks delicious. Can't wait for fresh tomatoes. With basil! Now that's my kinda salsa!